We don't actually make a project in this class... we just learn the amazing techniques and do some practice sewing. This piece is an example of what you can make after taking this class! Have you ever seen longarm quilters using rulers to keep their lines straight while in free motion? Or maybe executing curves and circles without having to draw on their quilts? Now, Leonie West of Australia has designed a system for domestic machines so that we can use rulers, too! 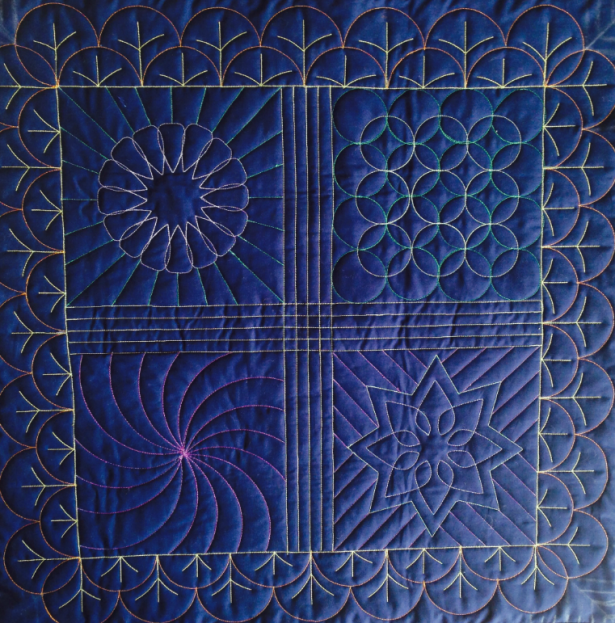 Her rulers are so mathematically precise that you will get beautiful results with a minimum of marking on your quilts. Once you have drawn your placement lines, you are good to go! The Westalee rulers have taken the thought out of figuring out where and how to place the ruler to get the best outcome. No walking foot needed for straight lines, minimal marking for the fancy stuff – this is really fun, easy and time saving!